Welcome to Day #2 of Chocolate and Orange Theme Week. Today's Orange Pistachio infused with Turmeric bar was created by Elements Truffles (Kearny, NJ). 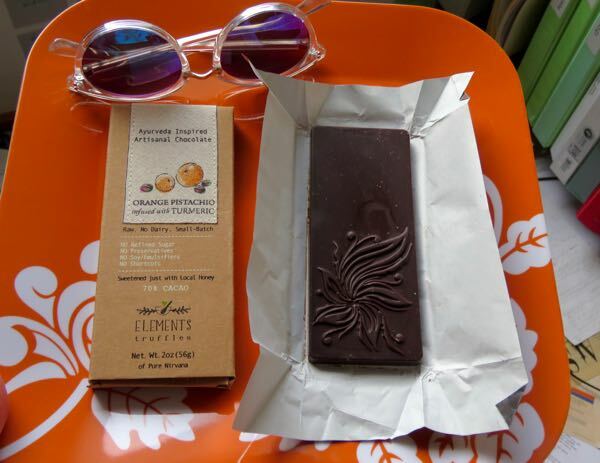 The company produces a line of "Ayurveda Inspired Artisanal Chocolate." 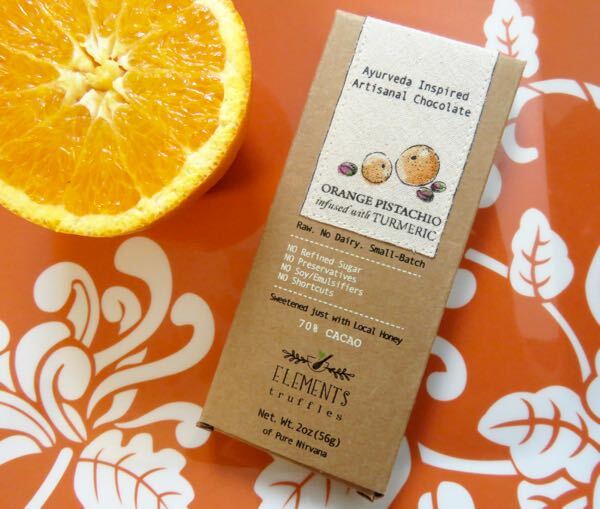 This 70% cacao dark chocolate had a balanced, complex and intriguing orange (orange essential oil) spice aroma, and soft, smooth texture and creamy melt (like a truffle). Organic, raw cacao butter (Peruvian Criollo) was the first ingredient listed and helped create the creamy texture. The cacao used to make this bar was: "Fair Trade organic cacao ethically sourced from Peru." Refined sugar does have a powerful ability to attract (or repulse). 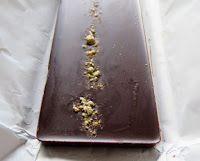 And chocolates (like this one), made with raw honey instead of refined sugar, do have a different, more relaxed feel to them. Honey scores lower on the glycemic index than refined sugar, and this chocolate scored a bit better on our (granted, somewhat subjective) perceived sugar buzz index. ** If you're seeking to be more centered and balanced, this is a good thing. This bar was made without dairy, soy/emulsifiers, preservatives, and/or gluten-containing ingredients; and made with a purpose: A percentage of the profits of these bars "go towards education of underprivileged children (www.careforchildren.org)"
** After sampling 4,000+ chocolates, one can sense a difference within the first few minutes between a dark chocolate bar made with refined white sugar and sweeteners such as coconut palm sugar, honey or stevia.